A rather quiet Saturday of prospect hockey involving New York Ranger and New York Islander prospects as both Hockey Canada and USA Hockey get serious about their entries for the 2014 IIHF World Under-20 Championships. With just about every team playing without some of their best players, the challenge for teams was to find ways to win games. With his team short 3 skaters Mackenzie Skapski (NYR 2013 6th) stopped 41 out of 31 shots in regulation and then 2 more in the shootout to help his Kootenay Ice earned a 3-2 shootout win over the Swift Current Broncos in Kootenay. The game's 1st star, Skapski bounced back from losing to Red Deer on Friday night to defeat the WHL's East Division leaders. Skapski weathered barrages from the Broncos in the first period where they fired 20 shots and the 3rd period when the Broncos out shot the Ice 12-6. Kootenay is currently in 8th place in the WHL's Eastern Conference 4 points ahead of the Red Deer Rebels (Rebels hold 2 games in hand). Skapski is 9-9-2 2.88 goals against and a 0.908 save percentage. 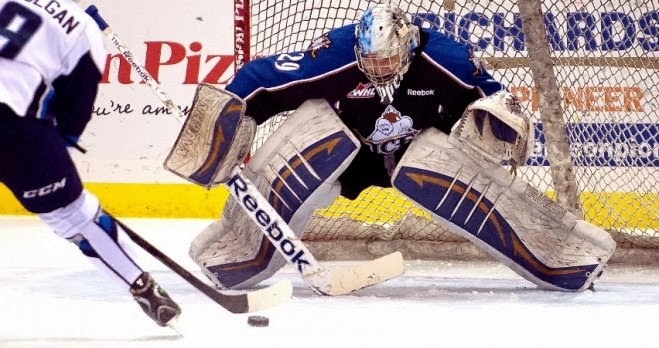 The Ice badly need Skapski to get on a roll as 500 hockey will not take them far in the WHL playoffs. Troy Donnay (NYR 2013 UFA) set up a goal as his Erie Otters get to enter their holiday break on a 10 game winning streak after earning a 4-3 win via the shootout over the London Knights. Donnay set up Dane Fox's 41st goal at 5:06 of the 2nd period which tied the game up at 2-2. For Donnay it was his 7th assist and 8th point of the season matching his career highs set last year. It might not seem like much but it took Donnay 68 games to do what he has done in 32. Even better in my eyes is how he is embracing the leadership role on his Erie Otters as the Otters defeated 2nd place London who has defeated Erie twice this season (which is half of the 4 losses that Erie has) and evened up the season series at 2-2 with London. Erie is off until December 28th and when they return will start the 2nd half of the OHL season with the best record in the league at 29-4-1-0. Ryan Pulock (NYI 2013 1st) and his Brandon Wheat Kings rebounded from Friday night's loss to the Kelowna Rockets with a 4-1 win over the Moose Jaw Warriors. Pulock was scoreless but his Wheat Kings with their win was able to maintain a 1 point lead for 7th place in the WHL's Eastern Conference over the Kootenay Ice. Adam Tambellini (NYR 2013 3rd) and his North Dakota hockey team made it 5 straight wins after defeating Northern Michigan 3-1. Tambellini was scoreless with no shots and was even for the game. His team is now off until January 3rd and 4th when they will play a pair of exhibition games against 2 Canadian University teams. Victor Crus-Rydberg (NYI 2013 5th) and his Plymouth Whalers were able to pick up a point but still lost 3-2 via the shootout to the Peterborough Petes. The Whalers extended their winless streak to 8 games (0-5-0-3) and Crus-Rydberg was scoreless for the Whalers. Jesse Graham (NYI 2012 6th) was scoreless as his Saginaw Spirit were defeated by the Kitchener Rangers 5-1. Kitchener scored the game's first 4 goals before getting on the scoreboard but by then (3rd period) it was way too little, way too late. Doyle Somerby (NYI 2012 5th) was scoreless as his Boston University Terriers lost to the Bentley Falcons 4-1. A very embarrassing loss for the Terriers losing to a team from the Atlantic Hockey league. Stephon Williams (NYI 2013 4th) was the backup for his Minnesota Mavericks and Kyle Burroughs (NYI 2013 7th) of the Regina Pats is out with a concussion.